The newly opened Rounds Premium Burgers was a short drive from the world headquarters of TheBurgerReview aka The Burger Busters. The restaurant had already been open for a week to work out the service kinks. This was another The Counter setup--we filled out our order slips with meat type, doneness, cheese selection, topping choices, etc. 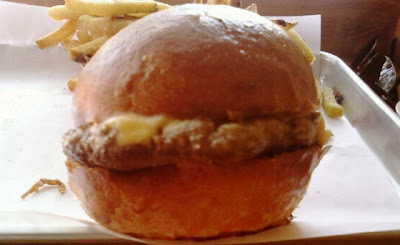 I went with a beef burger, on a brioche bun, with American cheese, and I asked for them to cook it to Medium. After a 5 minute wait, we got our burgers. The Beef: The beef at Rounds Premium Burgers was a beefy and juicy Chuck. They cooked my burger to Well Done, but it still managed to be juicy. The over-cooking actually melted more of the collagen in the Chuck to really bring out the beef flavors. The Sear: Meh...the sear was semi-present, but they only had the Wolf flat tops set to a cool 375 degrees, so even with the extra time on the grill, they failed to develop a solid, crunchy sear on my burger patty. The Seasoning: They hit the burgers with a salty blend while they were on the griddle. 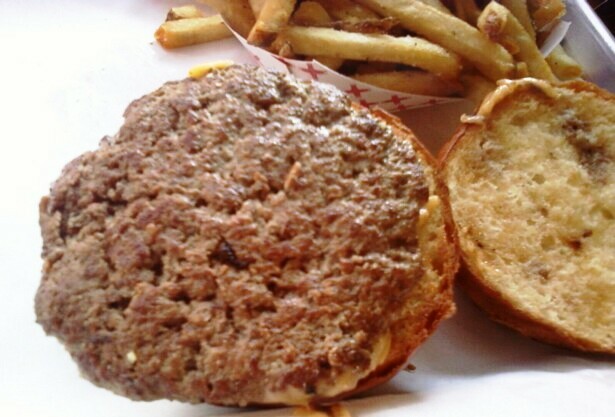 The seasoning was well-balanced and just salty enough to enhance the strong beef flavor in the cheeseburger. The Preparation: I ordered Medium, and they handed me Well Done....sigh. The burger patty was good, though. It was a Medium-Coarse grind--it was packed loosely. Again, the griddle should have been turned up to at least 450 degrees. That would have imparted a good sear to the beef, and it would have properly toasted the bun. The Cheese: The American cheese was perfectly melted so that it fused the top bun to the burger patty. Win! The Bun: Hmmmm.....the brioche was daunting in appearance. It was, however, fresh, moist, tender, yielding, and mildly sweet. Sadly, they oiled the top, and they didn't toast it well enough. Additionally, the bakery got them overly brown. This created a slightly bitter and leathery crust on the top bun. The Meat to Bun Ratio: 15% too much bun. While the brioche bun yielded and compressed nicely, there was still just a little too much bread in the bite. The Fries: The were nearly identical to what one would get at a Five Guys Burgers and Fries. 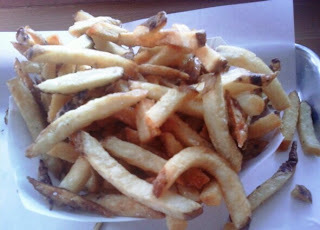 The fries were excellent..crisp, salty, and earthy. The Value: 11 bucks for a 1/3 pound burger, a side of fries, and a soda. The value was average. I could have done better at Wolfgang's Steakhouse. While this was only the second week of operation for Rounds Premium Burgers, I think I saw a reasonable example of what sort of product they delivered. That product was fine--it was a notch above average in terms of the flavor, but the preparation and bun brought it back down to average. 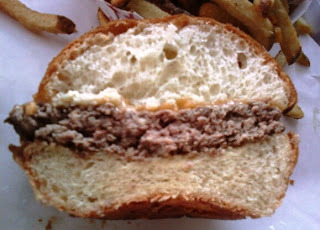 Burger Review : It beat the heck out of O'Burger!, Hamburger Haven, and Irv's. Rounds Premium Burgers served up a tasty but average cheeseburger for a reasonable price.